We donated a lump sum of £1,000 towards the project and it is great to see the new pitch bedding in very nicely and looking so good. The Trust asked all supporters groups for their backing to the project, we decided to give a donation up front towards the project. Why did we donate towards the project? 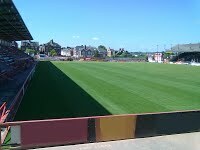 The moving of the pitch will benefit some disabled supporters as the pitch will be closer to the Big Bank and Flybe Stands disabled areas and with the pitch moved the club can plan for future redevelopments of the Old Grandstand and Away End of the ground, which at present does not have disabled facilities. The committee is as follows: Nick Saunders (chairman); Colin Atkins (vice-chairman); Jeanne Jones (secretary); Margaret Atkins (treasurer); David Jones and Steve Gazzard (press officer). After a number of unforeseen delays the roofing to area 7 in the big bank stand was finally completed early 2010, the supporters club helped part fund this roofing and kindly donated towards the total cost, the remainder coming from our End of Season draw of 2008/09. Our thanks go to the Supporters Club for their generosity and support. The Christmas draw we held in 2009 raised just over £1000, thanks goes to all those who helped sell tickets on our behalf and to all those who supported the draw. Plans are already in place for our next Christmas draw and tickets will be on sale very soon, priced at £1 each. We have decided to start selling tickets earlier this year as there are not that many home games coming up in November this year. Our draw will take place on 8th December 2010. It is the continuing aim of Exeter City Disabled Supporters Association to enable disabled fans to attend games, and for this reason we have purchased a wheelchair that can be loaned out for use by supporters who need that little bit of help at Exeter City home matches. 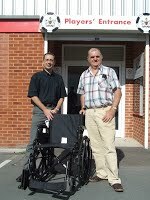 The wheelchair was recently handed over to Exeter City Operations Manager, Andy Gillard by David Jones, one of the ECDSA committee members and it is now available at St James Park for any fan who has need of it. Any supporter who has a temporary need for a wheelchair, for instance if you have a broken leg or similar injury which means you cannot walk around the ground, will be able to use it. It will also be available for disabled supporters who do not normally use a wheelchair but find themselves temporarily unable to manage, or, indeed for any supporter, home or away, who may have a genuine need for a wheelchair on a match day. If you feel you may need to borrow the wheelchair you are advised to contact reception at Exeter City before the day of the match to ensure it is reserved for you, although it may still be available at reception on match days if it has not already been reserved by somebody else. There will be no charge for the use of the chair, but anyone who uses it is invited to make a voluntary donation to ECDSA. This is another example of what ECDSA is doing to make attendance at Exeter City matches easier, and therefore more enjoyable, for disabled fans or those who are temporarily incapacitated. Stadium Manager Jon Underhill (left) talks to ECDSA members (left to right): Nick Saunders (Chairman); Steve Gazzard (Press Officer), David Jones (Committee Member); Jeanne Jones (Secretary) and Colin Atkins (Vice Chairman). Committee members of ECDSA were recently taken on a tour of St James Park under the guidance of Stadium Manager Jon Underhill, during which we were brought up to date with all the changes and work that had been carried out in the close season. With the pitch being moved at a cost of £150,000 all the stadium floodlights had to be repositioned and four extra lights had to be installed at the corners of the ground. The away end has undergone a radical change at a cost of around £10,000, which will hopefully make the problems of getting away fans in a thing of the past. The Stagecoach Stand has had £50,000 spent on it for new metal roof support struts and additional bracing of the timber pearlings. The dug outs have now been repositioned to the Stagecoach Stand which has meant that the dugouts in front of the Flybe Stand are no longer necessary so the old disabled enclosures have been returned to their old use without the obstructed views. Disabled fans returning to these areas are delighted with this arrangement. Work on the Big Bank and Flybe Stand meant that support bolts for both roofs had to be replaced at a cost of £15,000. More work has to be carried out but this can only be done when funds become available. Members were extremely impressed by all the work that has been done and found the tour very interesting and enjoyable. We all felt it was a very worthwhile exercise and believe that the ongoing ground improvements will continue to make attending matches easier and more enjoyable for disabled fans. Our thanks go to Jon Underhill for accompanying us on the tour making it both enjoyable and enlightening for us. Steve Gazzard, ECDSA press officer. Pictured are, Left to Right: Steve Gazzard (ECDSA Press officer); Detlev Nillies; Ralf Jaegermann; Colin Atkins (ECDSA Vice Chairman). 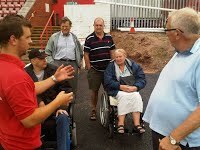 After their recent stadium tour members of the Exeter City Disabled Supporters Association met two football fans from Hamm in Germany who had come to look at our stadium. Ralf Jaegermann and Detlev Nillies are supporters of their local team, Westfalia Rhynern, who, we understand, play at a similar level to city. They appeared to be very impressed with our facilities and were overwhelmed by all the tributes to Adam Stansfield which were on display at the time of their visit. They had nothing but praise for the supporters and the tributes they had left. An Exeter City pennant was presented to them on behalf of ECDSA to take back to their club in Germany. After being Exeter City Football Clubs resident Vi commentator for 4 years, Matt Cotton left in September to go off to Southampton University, Peter Odgers was welcomed as the new Vi commentator and now joining Peter is Tristan Barclay. Tristan is a student at Exeter University, going into his third year. He is studying English, but his real interest is in studying media. He edits the student newspaper, which is published fortnightly and usually takes up about 25 hours of his time during press weeks, he does this as a volunteer and he says he enjoys it immensely so is happy to do it. He writes for the paper a lot and has also been involved in the student radio station, website and tv station. Over the summer Tristan worked for the BBC, Building Magazine, and the Times, so he has a decent grasp on what working in the press involves. In terms of sport, he’s a fanatic, particularly football and cricket. He’s played football since he was a kid and now plays for the university team. Tristan has been to see City play on several occasions and lives just a couple of roads away from St James Park. He’s not worked in commentary before, but is excited to learn as quickly as possible. This is great news for all visually impaired supporters that use the clubs Vi commentary service on match days at Exeter City. We would like to thank all those who bought tickets and supported us. We would also like to thank Roger Conway, who kindly officiated at the Draw and saw all was fair. New Commentator For Soccer Sight. ECDSA Members Say Thank you to Matthew Cotton & Welcome Peter Odgers. For the past 4 seasons many visually impaired fans have had their enjoyment of home games at Exeter City enhanced by the efforts of teenager Matthew Cotton. Matt has commentated on games for the ‘Soccer Sight’ scheme. His excellent commentaries have been broadcast around the ground through special headsets available from the club reception. Unfortunately student Matt has had to leave us to study at Southampton University, but this does not mean an end to the commentaries. Matt’s place will be filled by Peter Odgers who will do his best to fill his shoes in providing this valued service for visually impaired fans. Peter is no stranger to commentating at matches; he filled the breach when Matt was stranded in Portugal this summer because of the Icelandic volcano. He is a most welcome member of the team. Pictured are (back row left to right) Steve Gazzard; Peter Odgers; Matthew Cotton; David Jones (front row left to right) Nick Saunders; Jeanne Jones. Matt and Peter agreed that the secret of recognising the players is remembering details such as who is wearing what colour boots as well as noticing their physical features until, as their audience will confirm, they know each player as if they had known them all their lives. We welcome Peter and wish Matt all success at university. Matt has confirmed that he will visit the park on his breaks from his studies. Members of Exeter City Disabled Supporters Association met Matt and Peter before the match against Peterborough to thank Matt for his efforts, and to welcome Peter. The association has recently paid for the purchase and installation of a new floodlight to overlook the staircase at the back of the Stagecoach stand. It had been brought to the committee’s attention that the area was dark during evening games and at the end of matches in the winter months. The new light has made the stairs much easier to negotiate, especially for visually impaired supporters, and also a lot safer. Our website has been up and running since the end of September. To date it has received 733 hits of which 64% have returned to the site. We expected to receive hits from the UK but to date we’ve had hits from Australia; Belgium; Brazil; Germany; Greece; India; Ireland; Norway; Spain; Sweden; Taiwan; Turkey; Ukraine; USA and Vietnam. 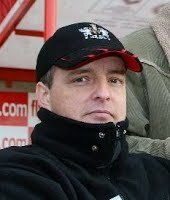 Our chairman, Nick Saunders also holds the position of Disability Liaison Officer (DLO) at the football club which he has done, as a volunteer for the past 8 ½ seasons (firstly named Disabled Supporters Representative before changing to DLO). Sadly he will be standing down from this position at the end of this season. During this time, Nick has worked tirelessly for the benefit of our disabled supporters. He has always put everything into his role. He has attended NADS (National Association of Disabled Supporters) conferences on behalf of Exeter City as well as representing the interests of disabled supporters at the club. He was also the driving force behind the setting up of ECDSA. Everyone at ECDSA & ECFC would like to thank Nick for his dedication, and all the time he has put into the DLO role. Nick will continue as chairman of ECDSA and the great news is that the clubs Stadium Manager, Jon Underhill will take over the duties of DLO from the end of the season and will be the first point of contact for all disabled supporters. We would like to welcome Jon to the position and we look forward to working with him for the benefit of disabled supporters. Our AGM will be held on Wednesday 6th July upstairs in The Park, Tribute Room, 7pm. All members and non members are welcome to attend. Our membership stands at 56 at present and new members will be welcome. Steve Gazzard, Press Officer ECDSA. ECDSA ‘Most Improved Player of the Year’ 2010/11. At the end of the 2008/09 season we gave out our first award to the Exeter City player who in our eyes was the most improved player for the season. Past winners of our award are George Friend, Dean Moxey and Liam Sercombe. ECDSA members have been voting again for this season’s winner and the award goes to a player who has stood out from others and his work rate for his team mates and for Exeter City is what you would expect and more from any player in your team. 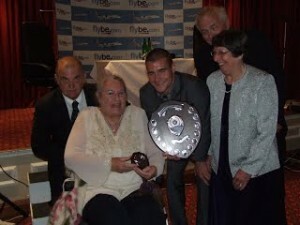 Committee members presented the award to this year’s winner at the Exeter City Football Club end of season dinner. (From left to right: David & Jeanne Jones; James Dunne; Margaret & Colin Atkins). Congratulations ‘James’ from everyone here at ECDSA. Award sponsored by committee member Steve Gazzard. 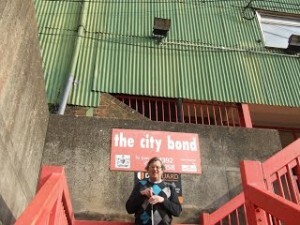 Hello & welcome to the 4th AGM of the Exeter City Disabled Supporters Association and this is my Chairman’s report. Last season we had a grand total of 56 paid up members. Membership has been steadily growing and our next aim must be to get to that magic 100 mark and ensure we keep our members happy with what we are all trying to do. As most people know, as a volunteer, I’ve also held the title of Disability Liaison Officer at Exeter City. Sadly, due to personal reasons I’ve now stood down from this position. When I first started representing disabled supporters, the club treated disabled supporters poorly as I was a victim of this back in 2002. This prompted me to join the supporters club and becoming disabled supporter’s representative. I must say, the club has come a very long way in how disabled supporters are treated and the facilities that are provided and I’m hopeful that this will continue. Jon Underhill (ECFC Stadium Manager) will be taking over from myself and he will be the first point of contact for all disabled supporters if they have any problems. If disabled supporters have still got a problem after contacting the club, they can come to us and we’ll deal with any problems with the utmost urgency. 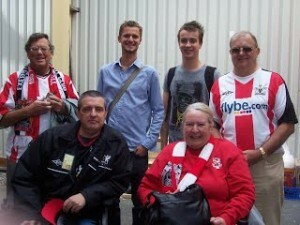 July 2010: – ECFC Disabled & Assistant Information: For the past 3 seasons we’ve been sending this information to all the clubs that Exeter City would be playing in the league so that visiting disabled supporters had a good idea of what disabled facilities are provided by the football club. We’ve always sent this information out via 2nd class post but to save money we sent this information out via email to all Disability Liaison Officers or Disabled Supporters Associations. August 2010: – Adam Stansfield: It was with great sadness to hear of the passing of City’s number 9 shortly into the new football season. He is missed greatly by his family; friends and everyone associated with Exeter City Football Club. We gave a small donation to both the Family Fund and the Adam Stansfield Foundation, both set up after the passing of Adam. A condolence card was sent to Adam’s family from all of us here at ECDSA. Stadium tour: Committee members were took on a tour of St James Park under the guidance of Stadium Manager Jon Underhill, during which we were brought up to speed with all the changes and work that had been carried out in the close season. Jon has given me an open invitation to all ECDSA members to attend a future Stadium Tour. Football supporters from Germany: After our tour we met two football supporters from Germany. Ralf and Detlev are supporters of their local team, Westfalia Rhynern. 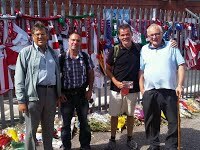 An Exeter City pennant was presented to them on behalf of ECDSA to take back to their club in Germany by Colin & Steve. They appeared to be very impressed with our facilities and were overwhelmed by all the tributes to Adam Stansfield which were on display at the time of their visit. They had nothing but praise for the supporters and the tributes they had left. This was picked up and reported on by a Scottish Disability Football Organisation called CAFÉ (Centre for Access to Football in Europe). September 10: – ECDSA President: For the 4th season running Bertie Cozic was our President, sadly Bertie has now left the club and we are hopeful of appointing another President for the forthcoming season. A big thank you goes to Bertie for his help and support over the years and we wish him all the best for the future. Website & email address: I was able to setup our very own website and email address, the website was free to setup and does not cost us anything to run. We’re using Google Sites as our website provider. To date we’ve had over 1000 hits with a 66% return rate. We expected to receive hits from the UK but we’ve had hits from 21 other counties including E.T. (1 country has not been set by Google or maybe it was E.T). Our website has information on everything we do and information on what facilities the football club has on offer to all disabled supporters and other sections on how disabled people can get into playing football themselves plus web links to other disability and city related sites. We have a web link on 90% of city related websites. October 10: – Wheelchair for Hire: We brought a manual wheelchair for the club. The chair is available for hire on match days from Club Reception. This chair can be used by anyone who has a short term disability and are in need of a wheelchair. There is no charge but we do welcome any donation. Sponsorship: As Bertie was our President we sponsored his Training Kit. We now have a signed training shirt from Bertie, as part of our sponsorship package with the club. Local TUC meeting: On our behalf, I attended a local TUC meeting and gave a small talk about what our association does. It was good to fly the flag on our behalf and spread the word of what we are trying to do. December 10: – Christmas draw: We made a profit of just over £***. ** from our draw, this was down from last years total but this was due to other fundraising causes running around the same time, which was understandable. Thank you, Colin & Margaret for sorting out the draw and for your hard work. Thanks also go to ecfcgirl and Northant Grecian from football forum Exeweb for selling tickets on our behalf and to Roger Conway (ECFC Director – Company Secretary) for stepping in and performing the draw on the committee’s behalf. January 2011: – Button Badges: We finally have our own badge. We had 250 badges made and the great news is that with Colin’s hard work, sold some of the badges and made a profit of £**. ** A badge was sent out to all our members. We do have a very small number of badges left that will cover any new members for this season. We hope to have new badges made for the start of the 2012/13 season. February 11: – Bucket Collection: The Supporters Trust on behalf of the football club again kindly offered us a bucket collection for the Southampton match and we raised just over £***. ** Thanks go to all our members who kindly helped with the collection. With some of the money raised we are having a Radar Key system installed to the disabled toilet door within the stadium, as this will benefit disabled supporters who find it hard to open or close doors. If this works out, we are thinking of getting the system installed to the disabled toilet within ‘The Park’ building downstairs as there is a problem with non-disabled people using the toilet, which is unacceptable. ‘It’s a disabled toilet for a reason’. 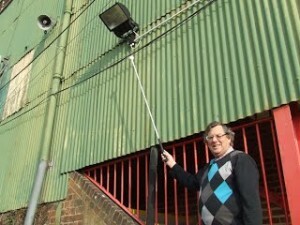 Extra Lighting for back of Old Grandstand: We paid for an extra floodlight to be fitted above the staircase to the back of the Old Grandstand, as the lighting was very poor to one section of the stairs. We’ve been told that the extra light does help light up the area better for the visually impaired and other supporters and it has made a massive difference. March 11: Recognised supporters group: We are now published by the football club as a recognised supporters group like other groups for when the club sell tickets via the clubs Priority System. All our members were on the clubs priority database but our association was not included in any published information by the club as a recognised supporters group. Thanks to Frances Farley, we are now treated the same as other supporters groups. One Game, One Community: In November Martin Weiler from One game, one community (Kick it Out) campaign attended one of our meetings. Disability is now included within their campaign and to follow this further I attended a meeting on our behalf. We have offered them our help with any disability wise issues and we have welcomed the chance to work together in the future. April – May 2011: – Disabled areas 6 & 7 in Big Bank Stand: We asked for markings to be put down in front of these areas and the good news is that the markings are now down. We hope this gives the stewards the help and support needed when asking supporters to move away from in front of these areas and areas are kept clear towards the end of matches so that supporters in these areas have a clear view of the pitch until the final whistle. Jon Underhill was thanked for getting this done. Most Improved Player of the Year: For the 2nd year running our members voted for the winner. The award went to a player who has stood out from others and his work rate for his team mates and for Exeter City is what you would expect from any player and how can we forget about his winning goal verses Argyle, we’ve been waiting 9 years for that. The winner of our ‘Most Improved Player of the Year’ for 2010/11 went too James Dunne and we all wish him well for this coming season. Committee members Colin & Margaret Atkins and Jeanne & David Jones presented the award to James at the football clubs end of season dinner. Our award was kindly sponsored by committee member Steve Gazzard for the 3rd year running, thanks Steve. As you can tell we had another busy season. One of my roles as DLO at the club was dealing with disabled parking and the setup of a waiting list to ensure all spaces were used on match days. Good news is that I’ve been able to bring this under the wing of ourselves for the coming season. There are only 6 disabled parking spaces here at Exeter City for home & away supporters and we can carry on ensuring that every space is used by disabled supporters only on match days. Outline plans for the redevelopment of St James Park has been published by the football club and we need to ensure that we are the driving force in ensuring that the club provides new and improved disabled facilities for all disabled supporters in the new parts of the redevelopments. This includes providing wheelchair space prevision in the away end of the ground. ‘We all like to be with our fellow supporters when supporting our team, being put in with opposition supporters can be very intimidating for some people’. I would like to stay on as your Chairman and if re-appointed I will ensure that we continue to help and support Exeter City Football Club in any way possible by adding or improving the disabled facilities and that all disabled supporters and their personal assistants are treated fairly, as you would expect. Finally, I would like to thank our committee members for their time and hard work for the benefit of our membership and Exeter City over the past season, our members for their continued support and to Exeter City Football Club for allowing us to use their facilities for free for our meetings and to all of you for attending this years AGM. Thanks again for coming along this evening and thank you for listening!